Laurie began her varied career in 1979 working in Activity Therapy at Riverview Psychiatric Hospital to put herself through SFU’s BSc. Kinesiology program. Following graduation, she left her hometown of Port Moody to work in Occupational Therapy at VGH’s Extended Care Unit. She continued in sales of home health care and mobility equipment before making the leap to the construction industry, completing an apprenticeship and journeyman certification in the trade of Painting and Decorating. After many years of painting and finishing work, Laurie decided get off the ladder and back in the classroom, as a lab supervisor to media production and online learning students at Capilano University until 2008. 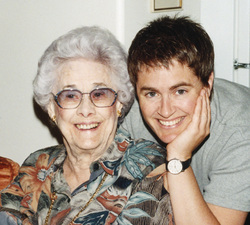 Throughout her career, Laurie spent a great deal of time with her Grandmother, who required more assistance to live independently in her own home as she aged. Weekly, Laurie went to Grandma’s home to help with anything she needed, from simple things like opening a jar, retrieving something from the basement, installing a hydraulic tub lift and raised toilet seat, washing and hanging drapes, setting up her patio for the season, labeling her keys and spice jars, installing a peep-hole, discussing confusing mail or billings, and trips to the hearing aid clinic. You name it, they did it and Grandma was able to maintain her independence in her own home to the age of 91. Laurie’s restlessness to pursue her own business enterprise lead her to look closely at her life’s work and the people she would like to serve. Following her Grandmother’s death, it was a natural fit to offer her suitcase of handy skills to other seniors in her community and Handy Granddaughter was founded in 2010. Laurie found the development of a solo business both terrifying and exhilarating, but also lonely and isolating. Discovering Fresh Air Life and Jenn Hewlett opened Laurie’s world to a community of generous women to share goals, ideas and feedback around life and her new business, as well as developing her stamina and core strength in support of her physical work for her clients. Fresh Air has been a vital partner in Laurie’s business success and confidence. 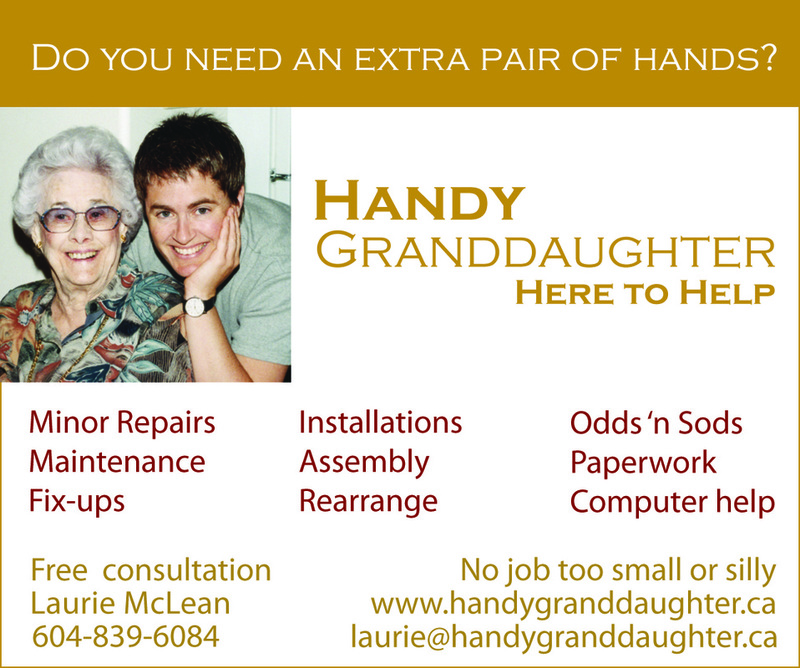 Handy Granddaughter provides independence and peace of mind to seniors and relief to their families. Handy services include minor repairs, installations, maintenance, fix ups, assembly, accessibility solutions, exteriors and computer help. No job is too small or silly! If you have or know of a senior or loved one in need, contact Laurie for a free consultation or access to her extensive network of senior’s service providers. "Both my parents (93 & 87) live in a care facility for the past 2 years. Despite receiving excellent care from the staff, I felt as if I was drowning in a sea of "to-do's." No matter how hard I tried, I never got caught up. Pictures remained unhung, drawers were disorganized, and clutter prevailed. Then I learned about Handy Granddaughter. Laurie has been a life saver. After one visit with Mom and Dad she made a floor plan of their room, suggesting how furniture could be arranged to make it easier for them to manoeuver in their wheelchairs. The next day she arrived with her tool kit and quickly hung pictures. A new clock took up less space on the bedside table. She even created a mini-garden for Dad to look after. I especially appreciate Laurie's manner with my parents. She is warm and respectful. They liked her right away. I asked her to accompany Mom to a medical appointment because Mom liked her so much. What a relief for me to know I have someone to call on when I am not able to do this. The difference she has made to our family is immeasurable. I can now enjoy visiting with Mom and Dad - and not be distracted by all the things I need to do. All those tasks are done thanks to Laurie! I am so grateful I learned about Handy Granddaughter. Her practicality, organizational skills, and understanding of the challenges older adults and their children face, make her one in a million. Thank you Laurie!"